After seeing all the trailers, meeting the cast and talent behind The Muppets, and visiting Jim Henson Studios, I was bursting with excitement to finally see the film on the big screen. I have known since the beginning that it is a film meant for the whole family to enjoy, and I went back and forth for days on whether or not to bring my 3-year-old daughter with me to see it. She didn’t end up coming, and after I saw The Muppets, I really regretted that she wasn’t there to share the moment with me. 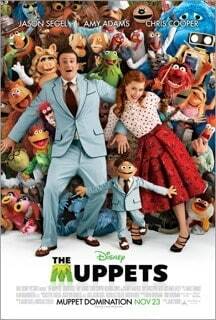 The Muppets opens in Smalltown, USA, where we meet Gary (Jason Segel), his girlfriend of 10 years Mary (Amy Adams), and Walter (Peter Linz), Gary’s brother. It’s Gary’s and Mary’s 10th anniversary, and as a special gift, Gary has arranged a trip to Los Angeles. The trip becomes less than romantic for Mary when Gary decides to bring his brother along. Walter, a lifelong fan of the Muppets, wants their first stop to be at the Muppets studio. All 3 of them are shocked to see the condition of the studio–but it shouldn’t be such a big surprise because the Muppets haven’t been done any kind of show for an entire decade. After Walter sneaks off into Kermit’s old office, he overhears Tex Richman reveal his plan to tear down the Muppets studio and drill for oil. But there is still hope for the Muppets–if they can raise 10 million dollars, they can have their studio back. Walter, Gary, and Mary set out to find Kermit the Frog and convince him to get the Muppets back together. At first Kermit believes it’s a lost cause, but Walter’s enthusiasm convinces him to find all of the Muppets and put on the greatest show the Muppets have ever done. With lots of laughs along the way, soon the whole gang is back together. When Tex Richman discovers that the Muppets are back together again, he sets out to ruin their show. The first half of The Muppets had us laughing non-stop; the clever jokes, witty story telling, and silly songs really kept us sitting at the edges of our seats, eager for what would happen next. The second half of the movie still had its humor, but it took on a more serious tone: Mary gives Gary an ultimatum, the pressure is on Walter to perform on stage during the Muppets’ show, Kermit wonders if Miss Piggy will sing their duet together, and all of the Muppets wonder if they will be able to raise all the money needed to make a new start. I loved the way that Jason Segel and co-writer Nick Stoller treated this script; I could not have thought of a better plot for this movie myself. The humor matched the original movies that I have seen featuring the Muppets, and I loved the new songs that were written, particularly “Man or Muppet?” and “Party of One”. There were a lot of families attending the screening with me, and I could hear everyone laughing, from little kids who probably didn’t understand the more adult humor but just loved the characters, to grown men whose more child-like sides were brought out because of the charm of this movie. The Muppets is a feel-good movie that will delight all audiences; make this THE movie you see on Thanksgiving weekend. Check out The Muppets on Facebook. The Muppets is in theatres everywhere November 23rd, 2011.